The past decade has seen the medium of comics reach unprecedented heights of critical acclaim and commercial success. Comics & Media reflects that, bringing together an amazing array of contributors--creators and critics alike--to discuss the state, future, and potential of the medium. 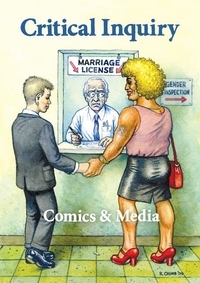 Loaded with full-color reproductions of work by such legends as R. Crumb, Art Spiegelman, Alison Bechdel, Chris Ware, Daniel Clowes, and Lynda Barry, the book addresses the place of comics in both a contemporary and historical context. Essays by such high-profile figures as Tom Gunning, N. Katherine Hayles, Patrick Jagoda, and W. J. T. Mitchell address a stunning range of topics, including the place of comics in the history of aesthetics, changes to popular art forms, digital humanities, and ongoing tensions between new and old media. The result is a substantial step forward for our understanding of what comics are and can be, and the growing place they hold in our culture.